People were thin on the ground at the club again this Tuesday. Ended up playing a couple of games of Humans!!! by Twilight Creations, the sequel\companion game to Zombies!!! Have scanned through the rules (which are available as online pdf) but this was the first play proper. The rules are slightly more complex than in Z!!! but not difficult once you get your head around the capture rules. These could of done with a little bit of rewording to reinforce the fact that Humans who can't escape are instantly captured and infected; this could of saved a bit of unnecessary dice and card action. There is also some room for confusion in the naming of the infection value and the capture cards. This is cleared up in the FAQ available for the game. We did not have this on hand and things may of turned out slightly different. The game plays out faster than Z!!! as well, with two games being completed despite the first being a 'learn as you go' affair. This might of been down to only having three players but the town layout seems more compact, and once you've got a few infections on the go you can easily start herding the humans into dead ends (pun intended). In both games there was one person who trailed behind badly due to luck of the dice and just not getting started with the infections. Have not tried a Humans vs Zombies game yet, it would probably require at least four players to make it interesting. No games arranged at the club due to missing campaign organisers, so the old fallback of Svea Rike came out again. Sort of got lucky with the cards having drawn the two Tax cards early on, add to that a number of Tax events occurring instead of wars and the merchants ended up having a hard time of it despite rolling in it for much of the game. Not much land bought so board was quite sparse other than the crowd of merchants clustered in Russia and Poland. Concentrating on resources netted me 15 points at games end, Dave S also got 15 but only because he had hidden his money from taxation, Martin and Colin trailed in with about 9 points each, Martin in particular took a battering toward the end with deaths of personalities and theft of resource cards. Also going on in the club was the usual Warhammer Fantasy games and Matt and Phil getting their heads round Flames of War. 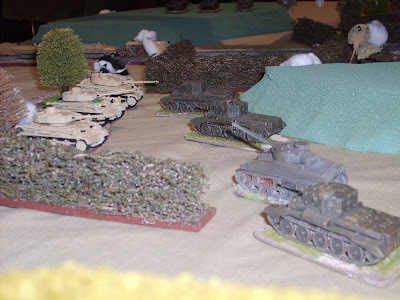 This WW2 game and its range of 15mm figures has become quite popular but is posibly past its peak, which makes this belated first outing at the club even more surprising. Given the speed of Svea Rike they soon had a group of spectators to annoy them. 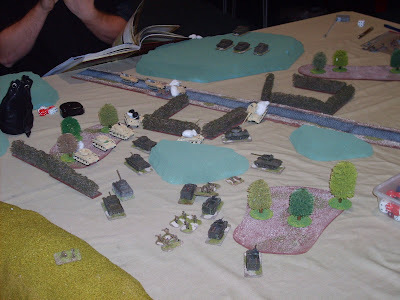 The decision is still pending on these rules as Phil used cursed dice (3+ needed, 1,2,2,2; followed by 3+, 1,1,1,2) so the result (Brits walkover Germans) was probably not indicative of the game itself. Vitrix have announced a new line of 4 Napoleonic era boxes, 2 for the Peninsula and 2 for Waterloo era. Plus more are on their way. This follows the lead from the Perry brothers and their Napoleonics (an extension to their own existing lead-based line). Add to that the Perrys trailblazing Civil War plastics sets, posibly the first non-Games Workshop set of hard plastics in general distribution. These hard plastics cover the mid-ground between Metal minis and soft plastic (i.e. Airfix) in the price range. Metals can be cheap but only when bulk ordered, hence certain manufacturers running purchase clubs. It's interesting that this relatively new and small field has already got start up companies directly competing against each other. Wargames Factory is releasing sets that support Fields of Glory, first being Romans (Late Rebublic but Early Imperial are also on the way) and Celts, but they have also released 'Zulu' era British. Warlord Games are also doing Romans (Early Imperial) and Celts. Unlike lead figures that can be turned out in small batches on demand, Hard Plastics are expensive unless done in bulk. But the molds used are metal and so long lasting making re-issues not as probmatic as molds for lead which are pliable and deteriorate with usage. I can well imagine a future consolidation of production into two or three companies, with the molds becoming the key asset.